Ease of use: Kashflow’s website has a straight to the point approach and the software is great to look at and very nicely presented. This accounting software is laid out very logically and flows very well. There are however a few awkward bits which affect the user’s experience. For example, every VAT rate combination is shown in the transaction drop down which was unnecessary and there was no easy route to getting started, such as an obvious way to set up VAT etc. A wizard or directions of some sort would go a long way in helping novice users. But all in all a good user experience. Speed: The speed is reasonable. Although entering transactions could be faster, the site has no lag and is one of the better packages for speed that we have used. 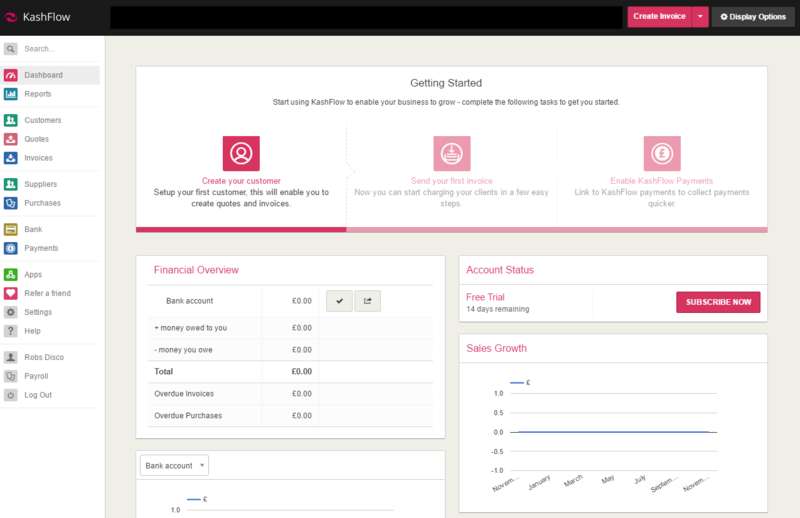 Features: A fair amount of features for the price, including invoice templates, automated invoicing, multi currency and bank feeds. Reporting: There were a lot of reports in Kashflow, 49 altogether! However some were not too user friendly to read. Ability to drill down was available. Price: Very well priced! For what you get, they price it very reasonably. .
VAT Handling: So close. This accounting software does support the flat rate scheme and cash accounting and the returns are laid out well. However the switch between accruals and cash accounting meant that VAT was included twice. Unforgivable really, especially considering there was not even a warning message for the user to check that VAT was accounted for properly. 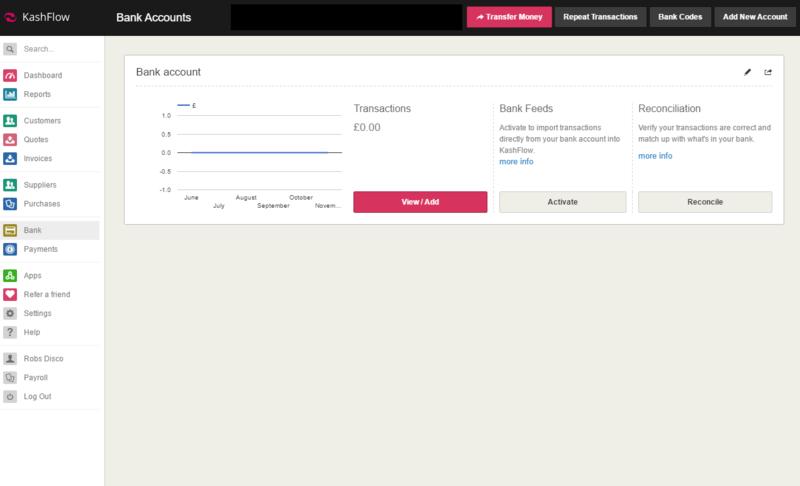 The bits we liked: The general feel of this accounting software is very good and the way it is laid out simply and logically makes it a joy to use. We preferred the way transactions were entered in Kashflow over most of their competition. We also like the amount of software Kashflow can integrate with. For example it talks to many e-commerce platforms so that data can be pulled out automatically into Kashflow making life easier for the business owner. Kashflow seemed to have the most integration available bar Xero. The bits we didn’t like: We didn’t like the VAT switch bug and we didn’t like the way a year end process had to be run, this reduces flexibility for the user and could easily have been avoided. A novice could use this software as it has a very simple layout. We would advise to get help with the initial settings though as this is not clear within Kashflow.